Let's start with the map and some simple facts. 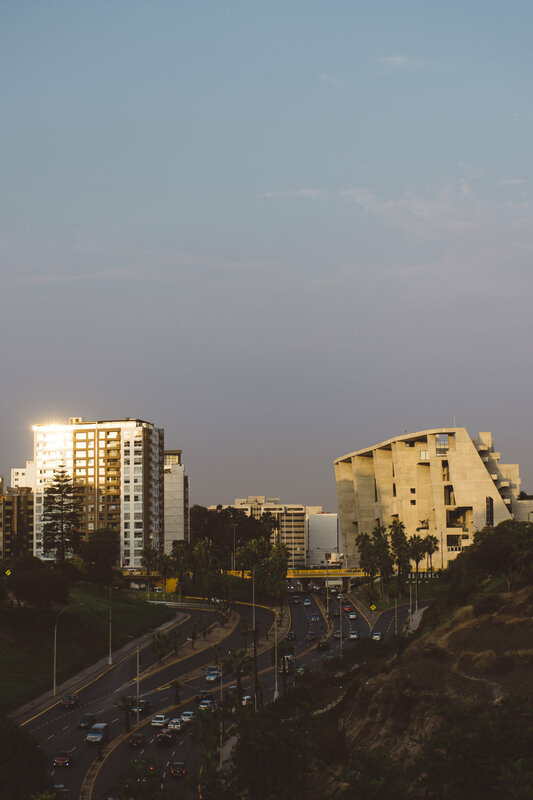 Miraflores and Barranco are two touristic/wealthier/hipster areas of Lima. Lima is the capital of Peru. And Peru is the home of the potato. Literally. Depending on whom you speak with in Peru you'll hear that they have anywhere from 3000 to 4000 varieties of potatoes, and LimaEasy.com pegs it at 3800 varieties so let's go with that. OMG I KNOW HOW AMAZING. Only thing that will be a bummer if you like potatoes, is, there are maybe like only, 10 varieties for sale. Ugh. 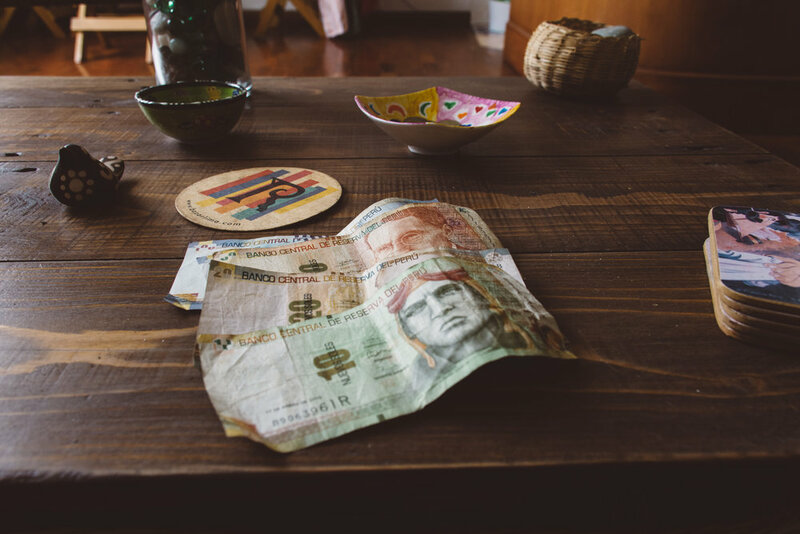 Only four other basics for you wrapped up in one long sentence: Lima has roughly 10 million people, who speak Spanish and trade you for patatas o papas (potatoes) with the Peruvian Sol (exchange symbol: PEN), at an exchange rate of 10 sol to $3 USD. Phew. Okay. Traffic in Lima is also notoriously horrendous, so really, you'll want to walk when you can. 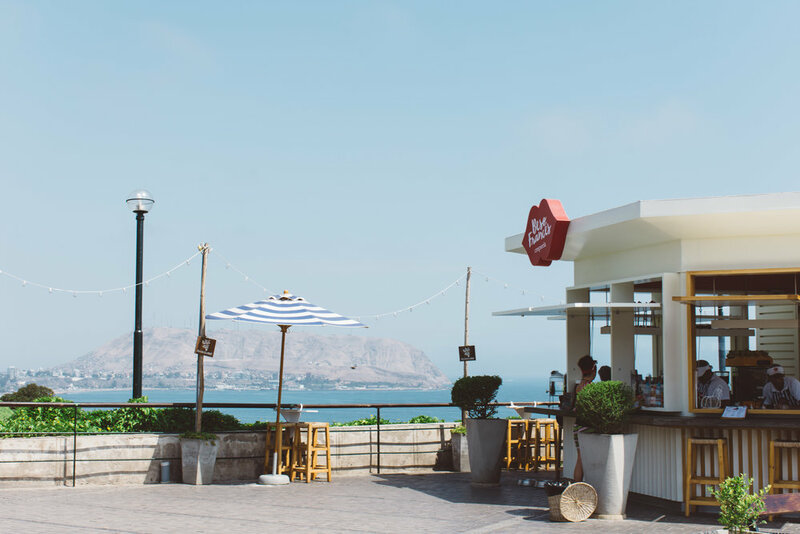 If you're staying in Miraflores, then use the QuickLlama shuttle. They're adorable, inexpensive, and offer free (spotty) wifi. Prices run about 15 sol each way, or like $5-ish USD. You can also do the AirportExpress bus. It's a bigger coach and a little pricier ($8 USD), but the wifi works and they're super profesh. Also, you can leave your luggage at the left luggage in the Lima airport if you're just quickly jumping over to Cusco for Machu Picchu and don't want to deal with your big bag. To be honest, I mostly walked or took Uber -- sign up for Uber, though, yeah, I dunno if I like the company either. The Centro to Miraflores to Barranco area is pretty easily navigable by foot. An Uber from Barranco to Miraflores will run you like $2ish/USD (8 sol). So... it was cheap enough to not bother with the bus system. 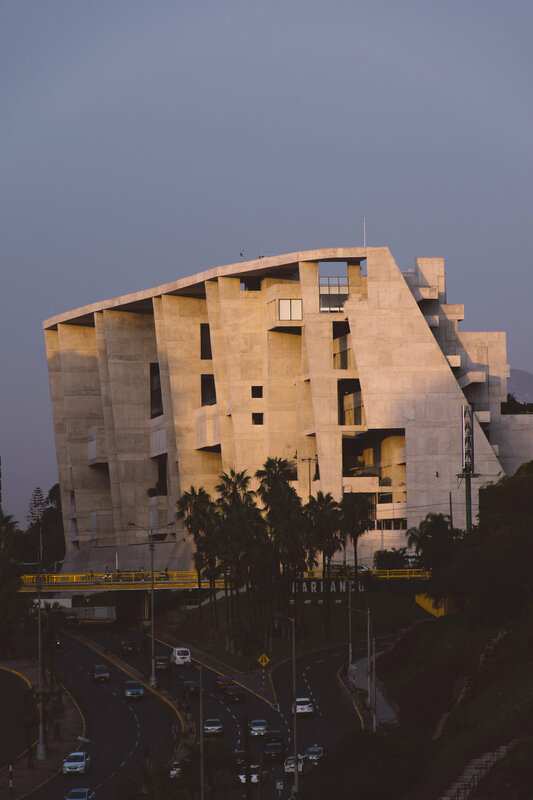 You can use the Metropolitano bus system, however, if you need to get around between Miraflores and Barranco too. The intrepid traveler should also give the minivans a go. These are little more than a shared taxi minivan that zigzags down busy boulevards. at a cheap rate of 1 to 3 sols (so like 50ç sometimes). I took one and we overshot where I needed to go, but I considered it a well-worth it 20 minute rollercoaster ride. So, Lima feels mostly safe, especially if you are sticking in Miraflores. It's just all tourists and police officers. Of course someone did try to ask me what I was up to, if I had friends in town, etc. etc. so I mean, just use your head if you look a little out of place. Barranco felt edgier but also very safe. The airport area definitely does not feel safe, but in the way Baltimore's gutted buildings equally look menacing. You'll be fine. Anywhere in this world is dangerous. Don't let a little bit of crime reporting stop you from traveling. 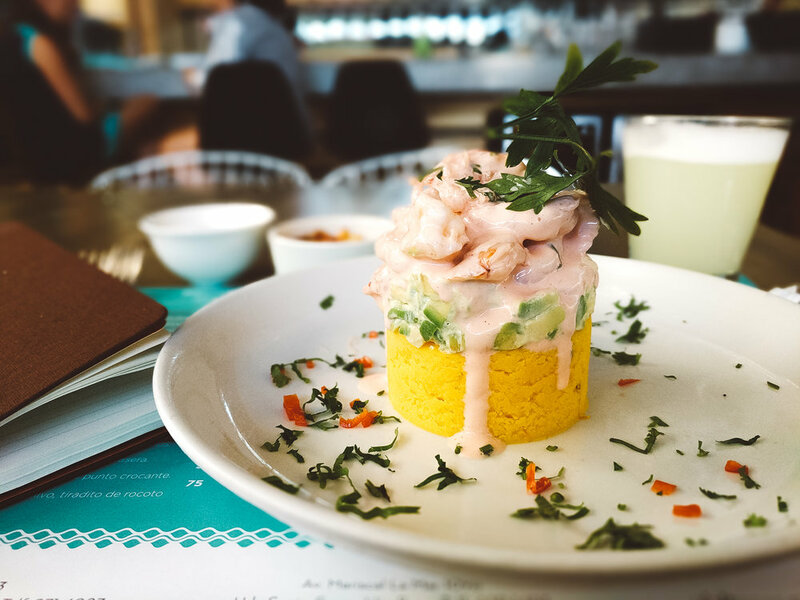 So you've downloaded Lonely Planet's guide to Lima like I suggested, yes? Congrats! Go to many of those places and you'll have a blast. Here are some of my suggestions for what to see and do too. Barranco, left. Hotel B cocktail area center. Hotel B living room, right. 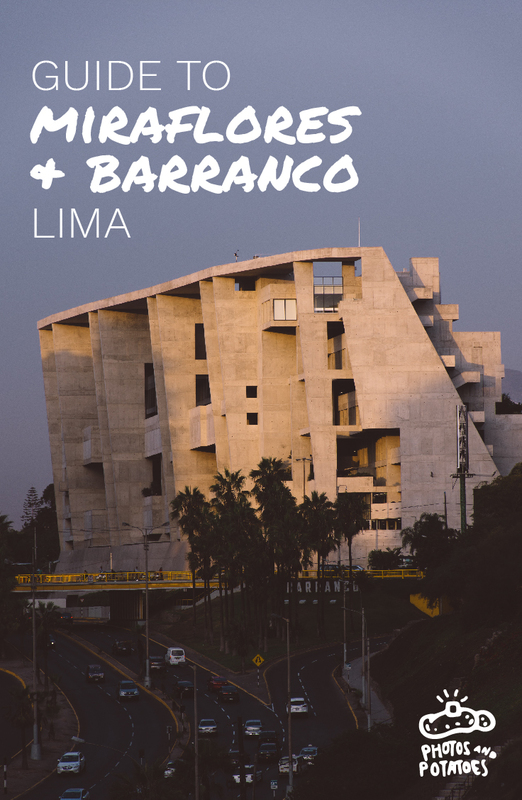 Barranco is definitely the arts district of Lima. Mate is a pretty cool photography museum featuring the photographer Mario Tetino's work. You'll feel like you're inside an advert. Kind of cool. Kind of weird too. Hotel B has some pretty cool art and cocktails all in a beautiful hotel. 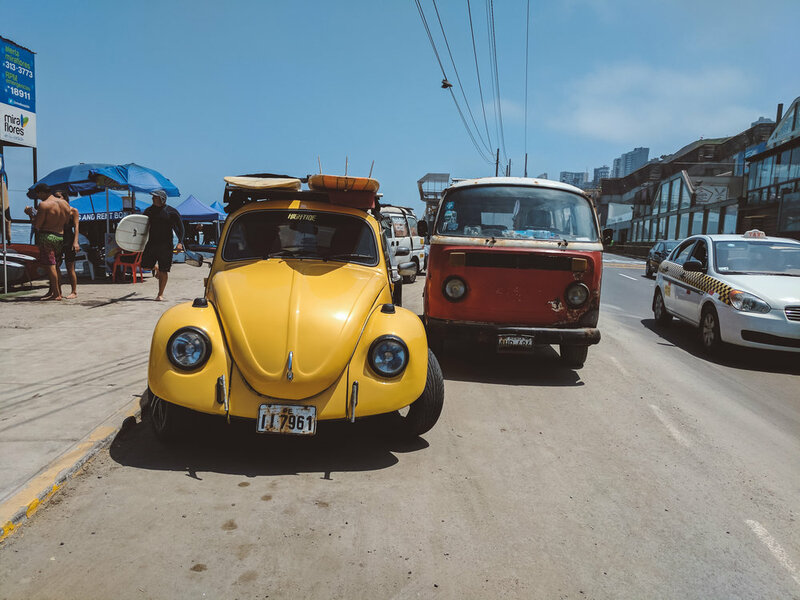 I'd recommend walking around Barranco, popping into galleries and getting coffee, then hitting the oceanfront before heading over to Hotel B for a nightcap. Una causa at Santa Pez, left. La Bodega Verde (also called the Green Winery, too) center and right. Okay of course ceviche is in the guide book. Go to Santo Pez (pictured on the left) for a slightly more upscale setting with the locals. 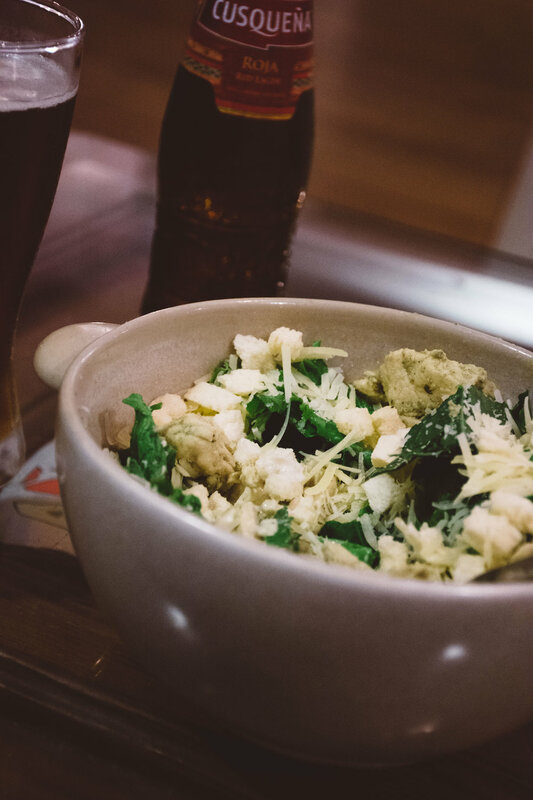 Then if you're in Barranco and in need of some greens, go to La Bodega Verde (two photos on the right) for a killer cool vibe and bowl of greens, or quinoa. You see them everywhere!! This will just be a way to see if you're paying attention. Up and down the Malecon you can find some beautiful parks like, Parque John F Kennedy or Parque del Amor. The wind coming off the ocean will cool you down and the beautiful flowers will perk you up. Six varieties of potatoes, but all while/yellow inside! Duh. Mostly you'll be surprised to realize that so many of the ones you expect to be purple inside, are in fact, yellow! You can do a taste test to see which kinds you like more than others. Not surprisingly, what the potatoes lack in color difference they make up for in a diversity of taste and texture! Lima is an absolutely vibrant city. Just walking around the streets, with the sun shining on your back, will leave you with a rosy feeling and perhaps some rosy skin too.